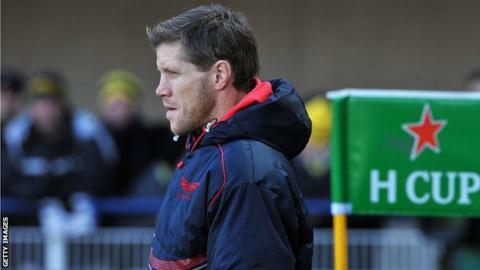 Scarlets have proved they can compete on equal terms with beaten 2013 Heineken Cup finalists Clermont Auvergne, says coach Simon Easterby. The French club's bonus-point win over the Welsh region will be followed by a re-match at Parc y Scarlets next Saturday. But having held Clermont to 6-3 until early in the second period, Easterby is confident ahead of that clash. "We've shown that we can compete with this team," said Easterby. "We've got to manage the game a bit better, probably and take more opportunities. "But we can take a lot from this performance." On Saturday Scarlets will not face former Wales full-back Lee Byrne who is expected to be out for around eight weeks after dislocating his shoulder in Clermont's win over the Welsh region last weekend. Easterby was particularly pleased that a team containing 11 players who were younger than Clermont's youngest battled until the final whistle. Replacement scrum-half Rhodri Williams scored for the visitors before prop Clement Ric ploughed over for the French club's bonus point. After Scarlets' defeat, Pool 4 rivals Harlequins registered one of the biggest shocks in the tournament with a stunning in Nantes. The day's results left Clermont on top of the group with two wins from three games while Quins, Scarlets and Racing have one victory apiece. Speaking before Quins' triumph, Easterby said his side must win their encounter against Clermont next weekend. "We've got to win. It's as simple as that," said the former Ireland flanker. "[On this occasion] we didn't give up, but we offered them, in the end, the bonus point. "The first half lasted about an hour, I think, so that's not ideal. "But the way they play here and the way they try and build the momentum probably suited us in the first half. "There was a huge amount of work. The effort was there, clear to see. "You've probably got to be a bit harsh on the control of the game and making sure that when we get into opportunities we take them. "[We] didn't have many of them in the first half; it was better in the second. "They're a fantastic force when they get the momentum. "They got it and we defended our hearts out, but I don't think they were a bonus point better than us." Easterby added: "We were competing against a side who have far bigger budgets than we have for 45-50 minutes, then they upped the tempo a little bit and we couldn't hang on to them."